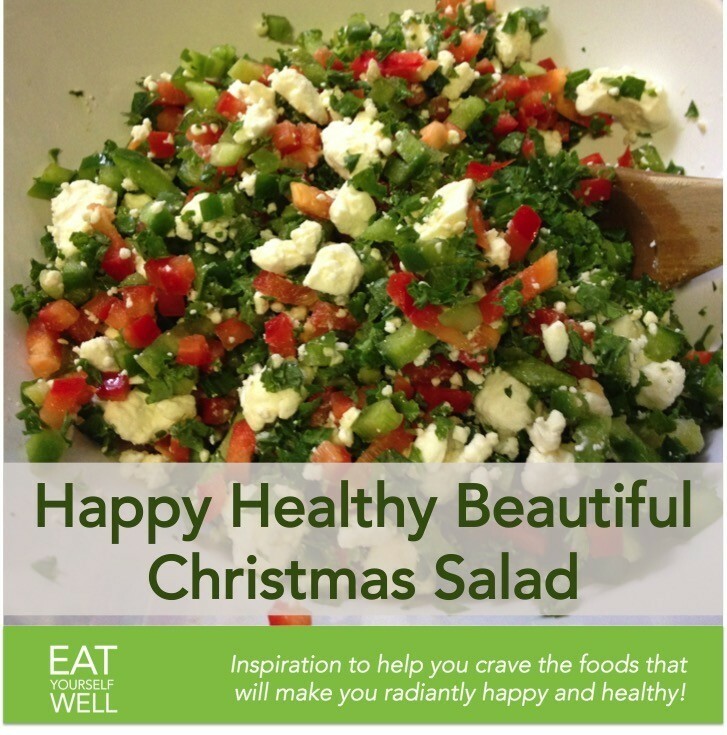 This simple Christmas salad is drop-dead gorgeous AND a welcome break from heavier holiday standards! I love using a veggie chopper like the Vidalia Chopper for this, because it makes perfectly even squares for a really pretty salad, and I think it even tastes better because there are so many tasty surfaces! 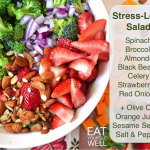 A big bowl of this salad plus a bit of bread is a great light meal, or add a soup if you need some warming! Celebrate in holiday colors with this fresh-tasting snowy green and white salad. ENJOY!! Cook the quinoa in the two cups of water (I’m guessing you have a favorite method already; if not, the simple method is to rinse the quinoa, add 2 cups water for one cup quinoa, bring to boil then turn down to simmer, covered, for about 15-20 min or until you can see the white curly bits). Cool the quinoa for a few minutes at least (can be cooked ahead and refrigerated). Toss together with the other salad ingredients, except feta cheese. Combine dressing ingredients in your blender and blend for a few seconds until smooth. This can all be done up to 4 hours or so before eating; add the dressing, sprinkle with feta and stir to mix, 30-60 minutes before serving to let flavors combine. Mexican style: add pepitas, tomato, avocado chunks, black beans and corn, and cumin. Mediterranean style: add oregano, olives, and herbs de provence seasoning. So …some (most? 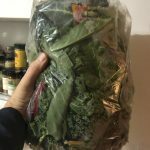 :-)) days, I look forward to comfort food for dinner … but don’t have the time it takes for most slow-cooked meals, and don’t want the junk that comes pre-packaged. 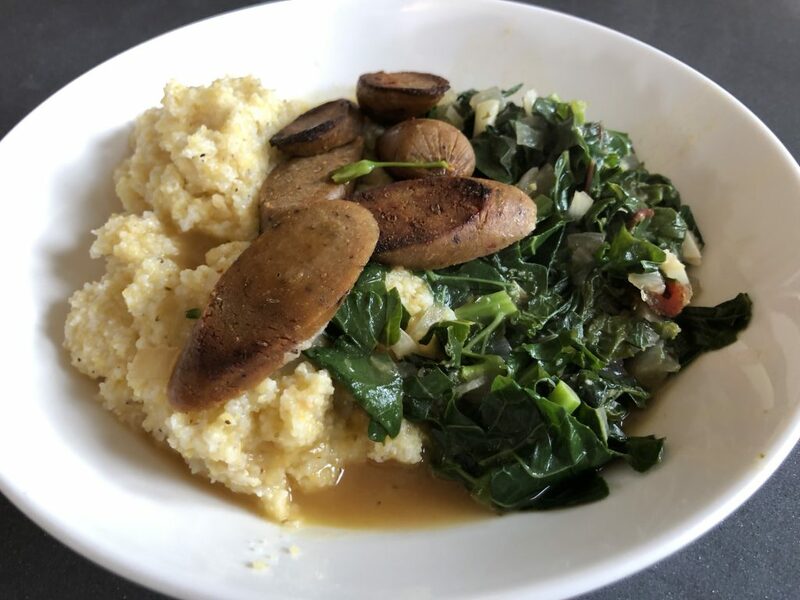 This super-fast grits/greens recipe takes no time at all, but tastes like love, feels like something grandma used to slave over, and takes <15 minutes from idea to table! Oh, and it’s ALL plant based – so you’re going to feel great afterwards! 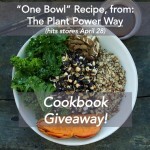 Feel free to play around with the recipe – use what you have on hand! No greens? 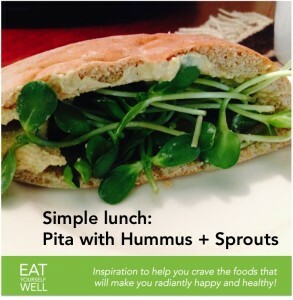 Sub broccoli (or brussels sprouts or …)! Have a batch of peppers about to go bad? Add them! And so on! Bring water and salt to a boil – dump in grits and stir. Reduce heat to medium low. Cook, stirring regularly, for 5-10 minutes, or until the grits are thick and creamy (cooking time will depend on the type of grits you use – course grains may take a little longer). When ready, turn off the head and stir in vegan “butter” or olive oil, nutritional yeast, non-dairy milk/cheese (if using), plus a grind of black pepper to taste. Even faster: bought these already trimmed and cleaned from the farmer’s market! Add a splash of olive oil to a large deep skillet or pot, and set to medium heat. Add onions and saute until almost tender, then add in garlic. Cook til onion and garlic are fragrant, about 2-3 minutes. Add vegetable broth, smoked salt and red pepper flakes. Now is a good time to taste the mix for balance. If it needs salt, this is a good time to add. Bring to a simmer, then add in the greens. It will seem like WAY too much, but toss the greens around a bit into the liquid and they’ll quickly start to reduce. Cook for about 5-10 minutes for tender young greens, or up to 20 minutes for more mature greens (just keep tasting little bits until it’s as tender as you like). Add a squeeze of hot sauce, or more salt, pepper, red pepper flakes if you like. If you can find Wildbrine Probiotic Sriracha, I would HIGHLY recommend it – kinda rocked my world when I made this today! But, any Sriracha would be delicious! This meal is delicious as-is, but if you would like some meat or something “meaty” on top, this can be topped with sausage or veggie sausage links (as shown in the pic). Just brown and slice before serving. In a low, wide, bowl, fill half the plate with grits, then the other half with greens. Spoon the pan liquids from the greens pan over everything, and serve and enjoy! Great by itself, but a vinegar-heavy side salad would be nice, too! 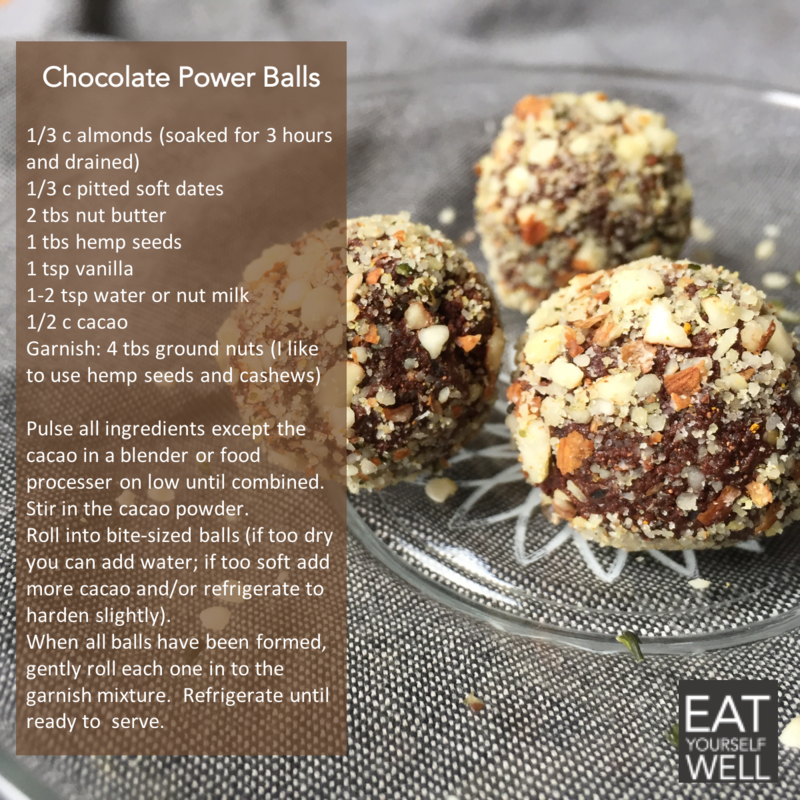 This Chocolate Power Balls recipe is one of the top 3 reasons I keep a small food processor on my counter – yes, that is precious space, but I like to keep a few fresh Power Balls in my fridge to keep me from making bad choices when I. Need. Food. Now! I try not to let that happen, but … life happens! And these make a wonderful portable breakfast with a hot cup of coffee … one of my favorites! I’ve dropped the instructions into the graphic itself, to make it easier to save/share on Pinterest, Instagram, etc., and have also posted the full written instructions below in case that’s easier for you. As always, feel free to play around with the ingredients: walnuts are delicious, macadamia nuts … you can substitute some of the dates with dried cranberries for a seasonal sweetness. Enjoy trying new things, and working with what you have on hand. 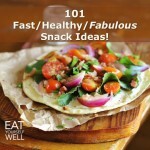 Delicious and nutritious snack to have on hand for after work or after school. And delicious with coffee! Put all ingredients except the cacao into the blender or food processor. Blend or pulse on low until combined. Pour the mixture into a big bowl; stir in the cacao powder. Roll in to bite-sized balls. If it is too dry you can add more water; if it is too soft add more cacao and/or refrigerate to harden the mixture slightly. Once all balls have been formed, gently roll each one in to the garnish mixture. Refrigerate until you are ready to serve, and enjoy! 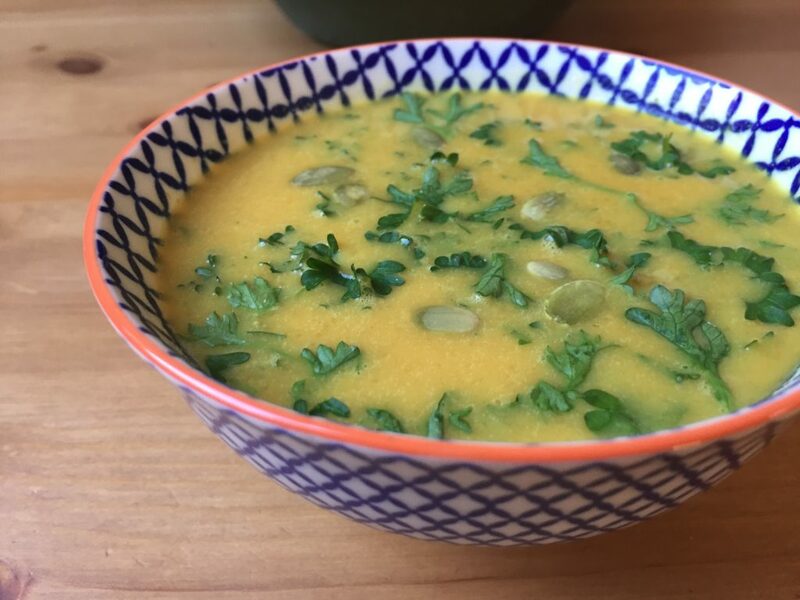 When it’s cold and wet outside (like today), I want comfort food with a kick … and this Butternut Squash soup, with its sweet and spicy flavor profile is really perfect. A light salad with a tarragon vinegar and oil dressing makes a perfect companion, clearing your palate and letting you rediscover the creamy warmth again and again. 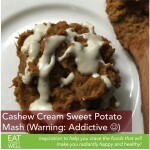 And fair warning – it’s a “little” addictive … so it’s good that it’s super-simple to make. All the best flavors – sweet and spicy – in a creamy, delicious, healthy soup! Click above to add these ingredients to your Walmart cart, or click here to choose other stores! 1. Heat the oil over medium heat; once warm add the shallots and garlic (finely chopped) and sauté until light brown. 2. Add the squash and spices, stirring frequently over the next four minutes. 3. Cover and simmer over low heat (until squash is tender). 4. Blend with immersion blender, add more spices as needed over the next few minutes of simmering (just for a few minutes after blending it all together), then serve with desired garnishes. Pictured here with parsley and pepitas (crunchy texture is awesome to offset the creaminess!). Also very tasty with a bit of candied nuts. 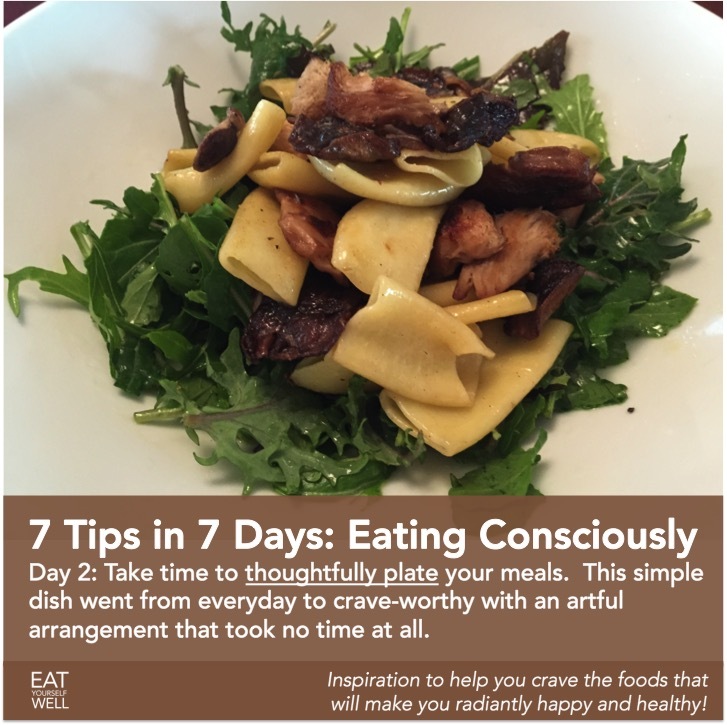 Another unconscious eating trap I’ve seen (and experienced) is forgetting about the visual part of eating. Marketers know that if you have a beautiful table setting and food arrangement, diners will mistake fast food for haute cuisine. 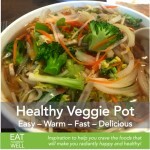 And many dieters have reported that when they involve several senses in their meals, they feel full faster and longer! So, it’s worth the few extra moments it takes to think through how to make your meal more visually appealing: thoughtful plating, a sprinkle of fresh parsley, or similar! And just in case you’re interested, the simple recipe for the mushroom salad is below. Prep the mushrooms and heat a cast iron or similar skillet with a bit of olive oil. When hot, toss in the mushrooms, and cook for about 10-15 minutes over medium-high heat, stirring/flipping occasionally, until slightly browned. Note: do not use a nonstick pan if you can help it. In addition to releasing chemicals, these pans keep the mushrooms from browning properly. When the mushrooms are ready, toss in the cooked pasta (great way to use cold leftover pasta) until the pasta is warmed through. Add fresh ground pepper, taste, add salt if needed, and then plate the salad with the mushroom/pasta mix over it. There’s not much cooking here, but a fair amount of chopping. It helps if you have a grocer with a good salad bar nearby … but even if not, it’s about 5 minutes of chopping, and I promise it’s well worth it! CLICK HERE TO SEE SOME OF MY FAVORITE INGREDIENTS! Put water on to boil, and prep the broccoli, peas, and carrots. Toss into the water and cook for 5 minutes. While the veggies are cooking, prep the mushrooms and cabbage. With a strainer, remove the vegetables (leaving water boiling) and rinse in cold water, and set aside. Add the mushrooms, cabbage, and bean sprouts to the boiling water, cook for one minute, then rinse in cold water, and add them to the rest of the veggies. In a large pot, heat the sesame oil over medium heat, and add the garlic, ginger, onion, and scallions and cook for about 5 minutes until soft. Remove from heat, and carefully (so it doesn’t splatter) add the broth and 1/2 to all of the cooking water from the veggies. If you want the soup brothy, add more; if not, add less. Add the noodles to the soup (using rice noodles will keep the broth nice and thin, as they’re less starchy), and cook until the noodles are ready. Add the veggies back in, top with sauces as desired, and serve. This is one of my very favorite recipes, because it’s endlessly variable. Add coriander with the cumin. Top with that leftover salsa. Slip in some spinach … and on and on. But I digress … here is the basic recipe! Optional: Avocado, pepitas, lime juice, walnuts, diced bell peppers, or anything else you have on hand! 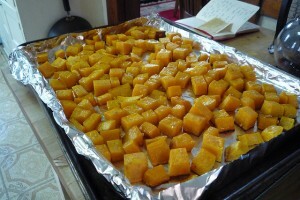 Slice the sweet potato into small squares (no need to peel first). Toss in just a small bit of olive oil, the cumin, and salt, put in single layer on cookie sheet (or similar) and put in oven for about 25 minutes or until brown. Stir once or twice so that they brown evenly. In the meantime, rinse quinoa, place in saucepan and add 2 cups of water. Bring to a boil, reduce heat to low, cover and simmer until tender and most of the liquid has been absorbed, 15 to 20 minutes. While they are cooking, put the raisins/cranberries, arugula and green onion into a bowl, and sprinkle with the vinegar, mustard, and salt, then toss to coat (yes, you can just toss it all in there and stir it around). Let sit for a few minutes, then add pepper and olive oil and stir it around again. Add any optional items you would like. 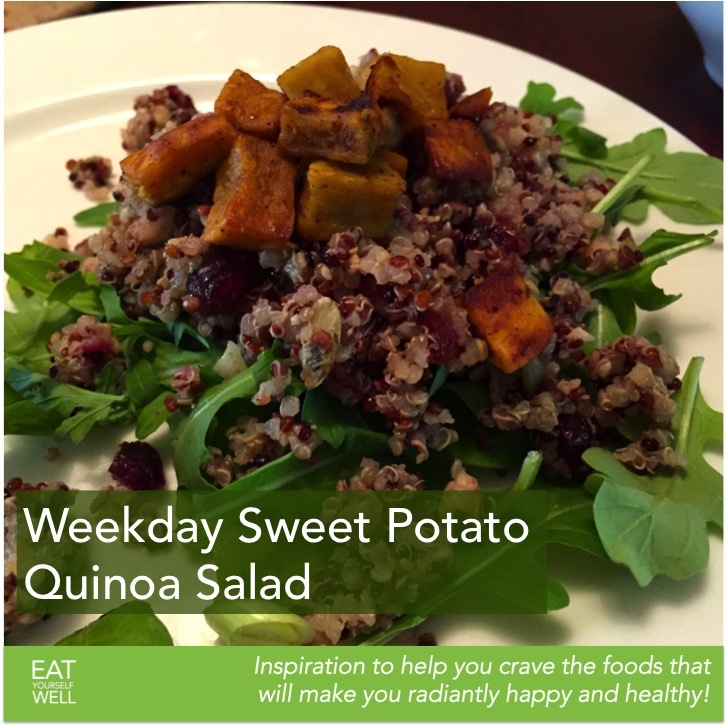 When it’s all ready, plate the salad, spoon some quinoa over it, and toss on the crispy, delicious, hot sweet potato. And have fun with this … have some fresh herbs on hand? Toss ’em in. Like garlic in your dressing? Toss it in. Don’t have raisins but have apples? Go with that. Enjoy! 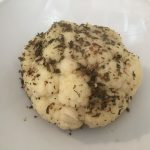 I thought I’d share my version of yesterday’s Food Challenge lunch … which was a little bit of a riff on the recipe for the day. When I went shopping to get wraps, the store had handmade whole wheat pita for half off, so I bought those instead; on this budget you get creative with what’s on sale, for sure! And, since I keep sprouts growing on my windowsill, I tossed those in for extra flavor, crunch, nutrition, and beauty. 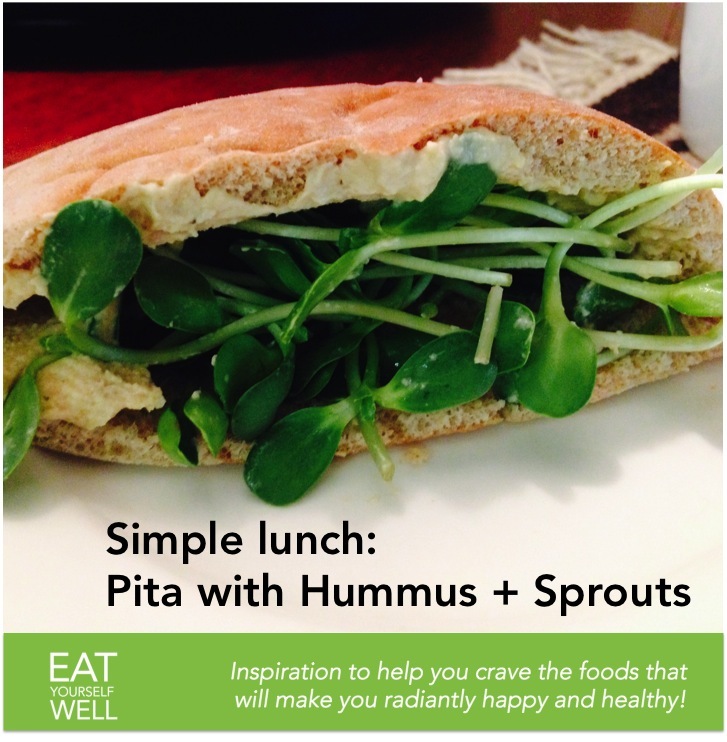 It was SO simple and delicious – I will do this again and again anytime I need to grab a quick, simple lunch that’s also healthy! Cut the pita in half and spread hummus on both inside surfaces. Toss sprouts into the pocket, sprinkle with turmeric and black pepper (or any other spices you like), and eat! 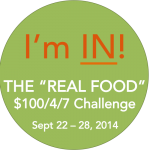 Would REALLY like to hear from you – how is your challenge going? Mediterranean Feast in <5 Minutes! 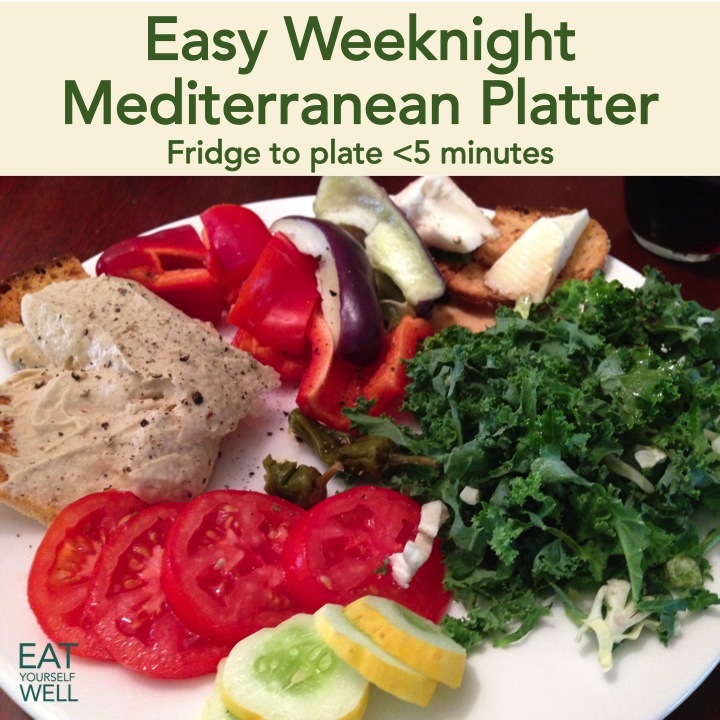 With just a little planning and some common prepared foods on hand, weeknight dinners can look like this Mediterranean Feast – in under 5 minutes! Be sure to plate them in a way that pleases your eye as well as your palate (yes, it matters) … those fast-food places on your way home won’t stand a chance. Plus, this kind of eating – little bits of several high-nutrient and high-quality foods – is a great way to give your body a variety of nutrients to support your health! Any other in-season veggies – avocado, chickpeas, carrots, celery, etc. 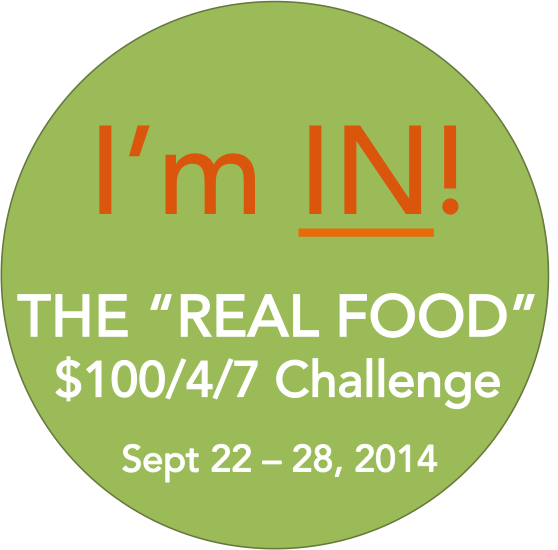 Raw, organic almonds, cashews, etc. Leftover grains of any kind – quinoa, freekeh, etc.